On Friday Carol was off playing with her mother and I was left at home to amuse myself. So, after I’d finished my chores, I took myself on another hunting expedition, armed only with a camera, to Sandhouse Lane Nature Reserve to see if I could add to my growing collection of insect portraits. The sun was being typically shy when I arrived so the only activity in which the butterflies seemed interested was resting and conserving energy. Inactivity makes them a little difficult to spot so I resorted to the rather unsubtle device of tramping about in the vegetation to scare them up. 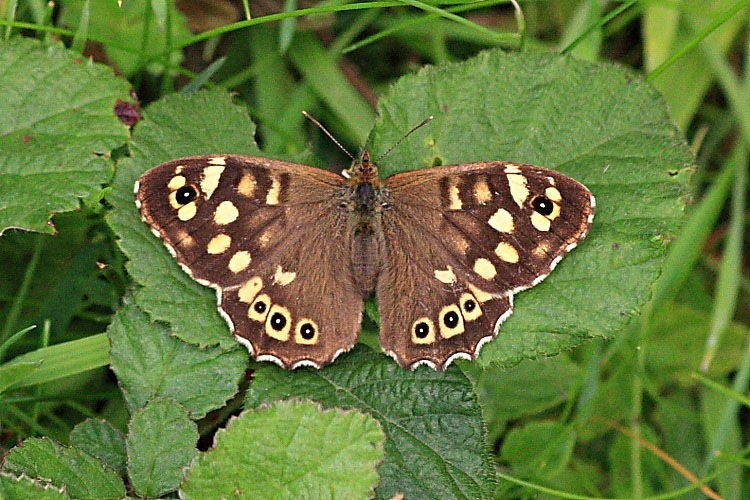 Close to the trees I managed to disturb and track a Speckled Wood (right) which obligingly settled back down on the ground for me to photograph. I wasn’t seeing anything else new in butterfly land so I wandered around the rest of the reserve to see what else I could find. What I found was quite a few damselflies and dragonflies, a couple of which cooperated long enough for me to get the camera fixed on them. 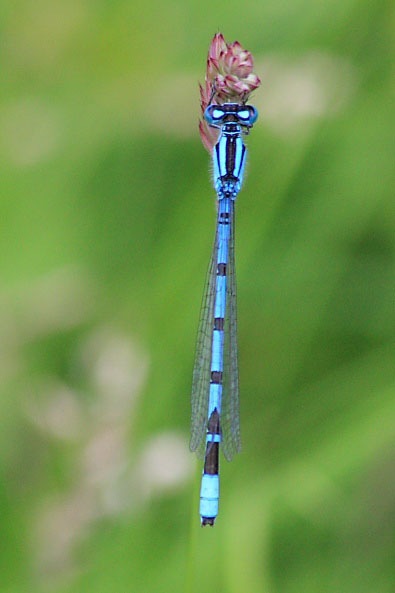 The damselfly (right) is a so-called Common Blue Damselfly. That seems to be a rather ignoble name to me for such an attractively marked and delicate creature. 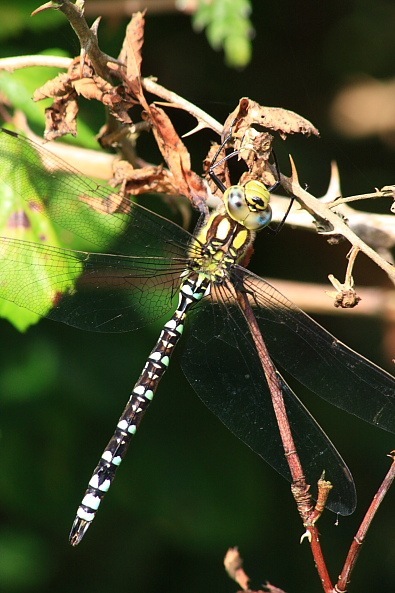 The dragonfly (left) is the similarly common (what else would I expect) but somewhat oddly named Southern Hawker. I assume it doesn’t keep spitting and the only thing that I can see it selling is death to other flying insects. Imagine being a modestly-sized fly and having that giant screaming at you head-on. This specimen had a wingspan of about 3 inches/75 mm. The sun did put in a half-hearted appearance for my second hour and managed to liven up the locals a little. 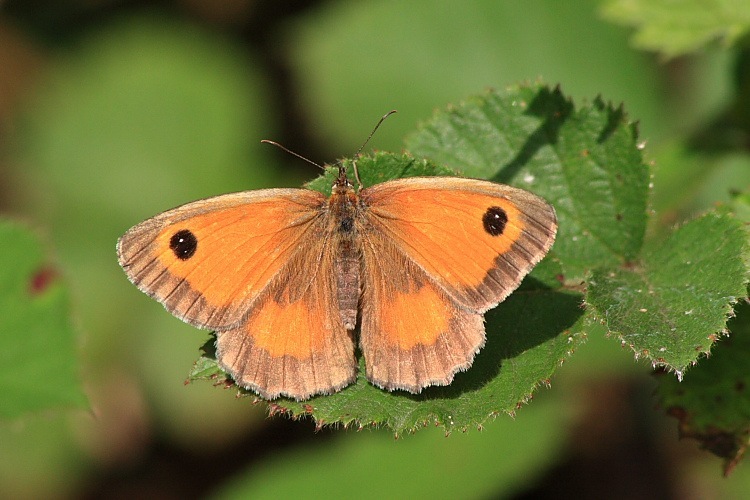 On a second visit to butterfly heaven I snagged a better shot of a Gatekeeper (left) courtesy of there being more light making possible a tighter aperture setting. Then, as I was leaving, a couple of whites began feeding perfectly positioned at my eye level. How considerate of them. Whites can seem a little tedious compared to their more colourfully marked cousins. 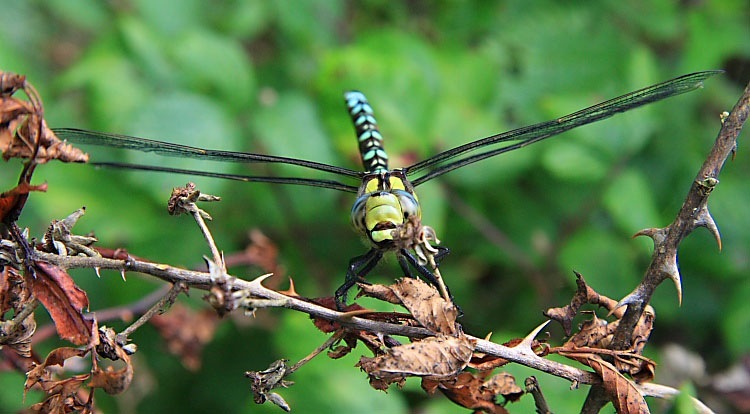 They also tend to keep their topsides hidden since they most often settle with their wings closed. 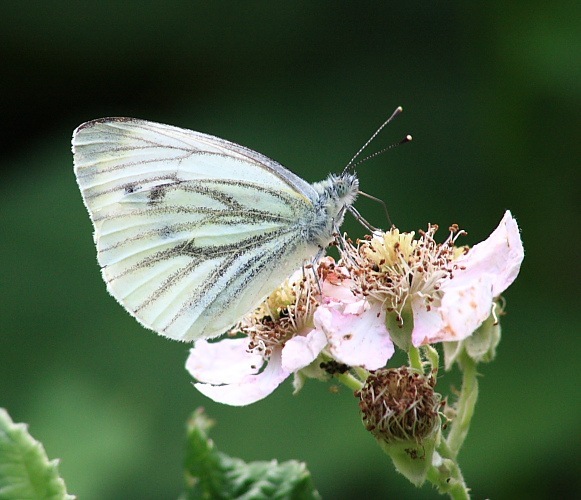 In the case of this Green-veined White (right), though, the situation was perfect as the markings giving rise to its name are on its underside. Just look at the eye, too. It’s speckled – quite staggering. A very worthwhile trip from an initially unpromising day.